Those who know the Aloha State understand the significance of Hawaiian artwork to its culture. From the ancients to today’s resident artists, Hawaii has produced an array of stunning art works. 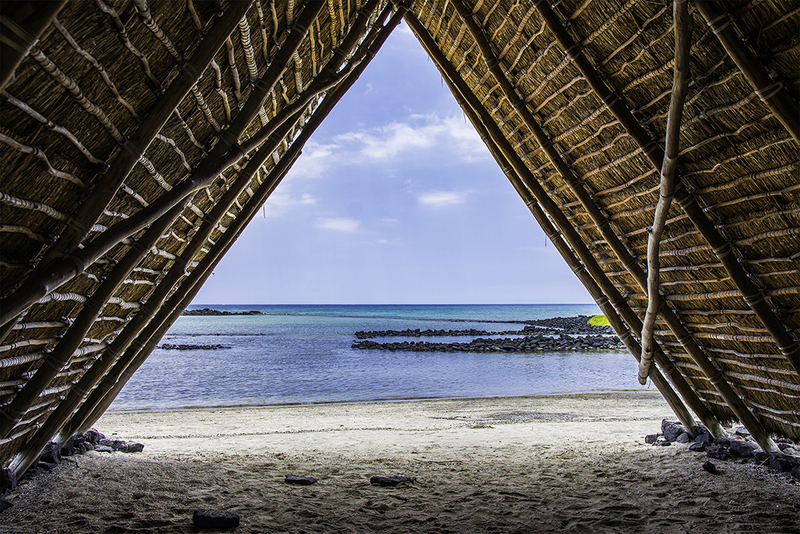 You can see this in the form of koa wood carvings, feather designs, coconut weavings and kapa bark cloth. You’ll also see it in scrimshaw etchings, woven leis, petroglyphs, sculptures, quilts, prints and painted landscapes. The styles of art in this state are as diverse as its residents. Each creative expression reflects a unique aspect of the mysterious beauty of the Hawaiian Islands. 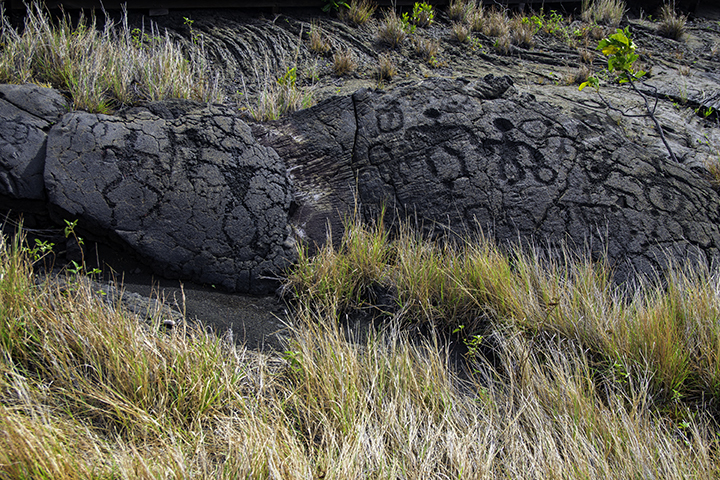 Petroglyphs at Hawaii Volcanoes National Park. Ancient Hawaiians were skillful and resourceful craftsmen. For example, the Hawaiians would beat bark from the wauke or paper mulberry tree and soak it in the ocean. Then they would repeat the time-consuming process to create the woven cloth, kapa. The bark becomes supple and easily woven into beautiful cloth with rich colors and designs about nature and life. A select group of kapa artists still exist, devoting their lives to preserving this type of Hawaiian artwork. Example of using hala leaves in Hawaiian shelter building. Using natural elements around them, Hawaiians would also make lauhala by weaving large green hala leaves together. By doing so, they would make shelters, hats, baskets or floor mats. Another ancient tradition was designing intricate arrangements of hulu manu for Hawaiian royalty. These were adornments the Hawaiians made from ornate bird feathers. And they delicately wove them into headdresses, leis or capes. The ancient Hawaiians would also carve koa wood into tikis, paddles, bowls, hooks, utensils and even shark-teeth weapons. As tourism increased, westerners and Asians came to the islands. They brought their unique arts which would become a part of the greater Hawaiian melting pot. Every island reflects this diversity. It blends traditional Hawaiian artistry, modern art and the work of local artists from diverse backgrounds. 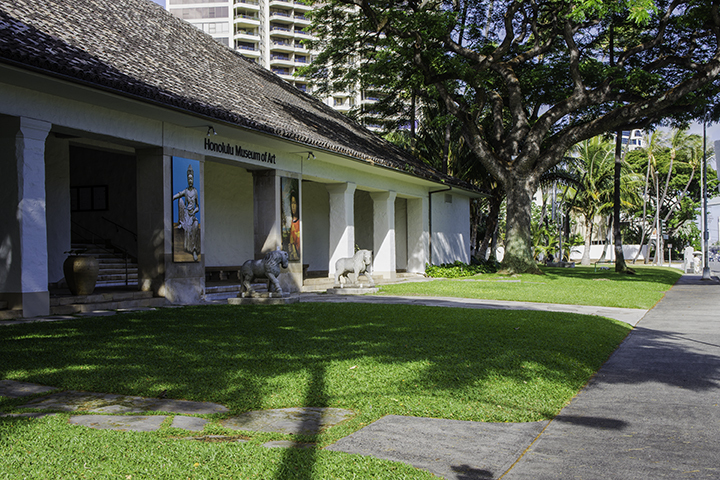 On each island, tourists can find galleries and museums filled with compelling Hawaiian artwork. Oahu draws the largest crowd of tourists, and in particular, to its capital city of Honolulu. Visitors can expect a wide variety of museums on the island. Some of the best places to view and purchase art include the: Hawaii State Art Museum, Honolulu Museum of Art and and the Bishop Musuem. You can also view Hawaiian artwork at Cedar Street Galleries, Makaha Art Gallery, Pegge Hopper Gallery, Hawaii Craftsmen and Uhl Studios Hawaii. Historic Lahaina has the Lahaina Museum Shop and the Wo Hing Temple Museum. Other artistic Maui spots are the Bailey House Museum, Hana Cultural Center and Museum, Hana Coast Gallery and Maui Arts Cultural Center. Also, there are numerous galleries in Lahaina and Ka’anapali areas. Paia and the Upcountry areas of the island also have galleries where visitors can enjoy a wide range of art forms. Examples include: the Paia Contemporary Gallery, Viewpoints Galley Gyotaku Maui and Maui Crafts Guild. In Wailea, the Dolphin Galleries, NaPua Gallery and the Eclectic Image Gallery of Maui also offer unique art pieces. Kauai is famous for its striking film locations and film tours. But here, tourists can also enjoy art galleries and museums at the Grove Farm Museum, Koke’e Natural History Museum, Kauai Museum, Waioli Mission House Museum, Mark Daniells Galley and Ship Store Galleries. Visitors can admire historic and modern works of art at the Hilo Art Museum, Hulihee Palace, Pacific Tsunamis Museum, Sachi Art Hawaii, Waipio Valley Artworks, Wyland Galleries Hawaii, Volcano Art Center and The Grove Gallery. For insights into traditional art, visit the Anna Ranch Heritage Center and the Lyman Mission House and Museum. Visitors to Molokai can find a beautiful collection at the Molokai Fine Arts Galley. While travelers to Lanai can enjoy the Mike Carroll Gallery.